I work at an office where the median age is, oh, let’s say 29. It’s a modern workplace—an open floor plan with an abundance of plush couches, and a SNES Classic in the break room. The social center of our office is the kitchen. The fridges are stocked with sodas and canned sparkling water. There are two beer kegs on tap. There are frequent snacks like Sun Chips and fruits like bananas, and on Wednesdays, we get catered lunch. Which is to say, hunger and thirst at Onion Inc. is easily remedied. That is great—as well as problematic. An article in the Journal Of The Academy Of Nutrition And Dietetics was published in November, but came to my attention today via Philadelphia NPR affiliate WHYY. 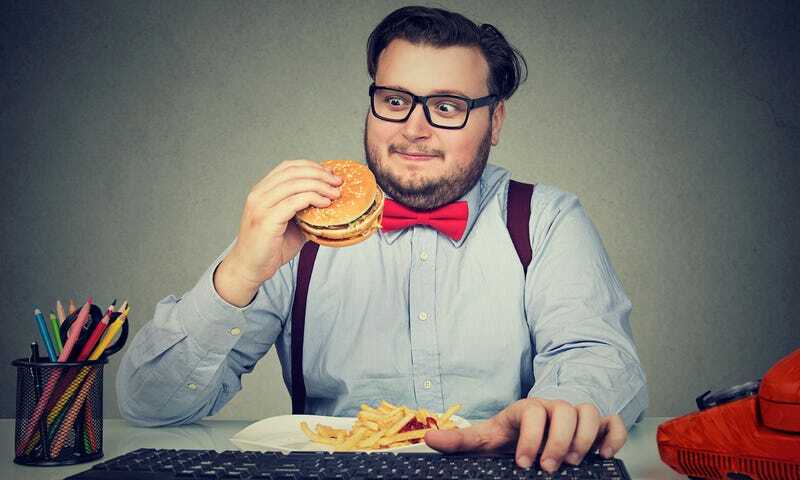 The study looked at the workplace eating habits of 5,222 American workers, and there were some notable takeaways—mainly that we eat like gluttons. The top-line statistic for me was that nearly a quarter of workers surveyed, through free or purchased foods at work, added 1,292 calories each week. That’s nearly the equivalent of ingesting two extra Big Macs and a small McDonald’s fries. There’s more from the study, originally conducted in 2012-13, that was worth noting: Of the most calorically dense free office foods, pizza was tops, followed by sandwiches, regular sodas, and cookies/brownies. And it found that college graduates were more likely to receive free office food, but that’s fairly simple to intuit, as college graduates were more likely to work at a larger employer with perks than someone with only a high school diploma. When food is a workplace perk, I compartmentalize those eating decisions into another part of my brain. As soon as “free” is involved, my criteria suddenly changes—it’s no longer about satiation, much less nutritional benefits, but how much value I can wring out. The word “buffet” is, really, a state of mind. I will automatically pile six strips of bacon, three sausage patties, and a pint of scrambled eggs onto my free breakfast plate as if there was a global shortage, even though being seen with this quantity of food is embarrassing. I had never worked at an office with free food before The Takeout, and it took me a full year—with frequent indigestion and stomach pains—to consciously refrain myself from taking seconds and thirds on staff lunch day.